Our English-speaking Balinese guides are from here and know the most scenic trails and best views. 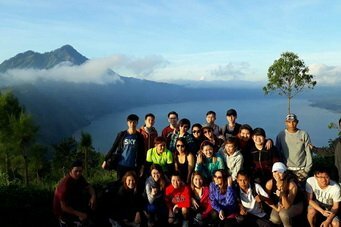 We pack a lot into this hike with its stunning views and traditional boat ride so book with licensed, experienced guides who know Batur and its secrets. It’s true. 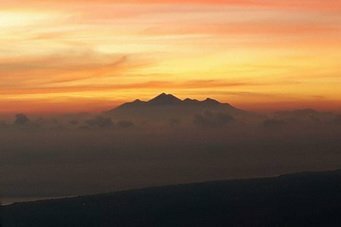 The mountain peaks can give you some of the most far-reaching views, but the scenery from the Caldera is like nothing else in Bali. 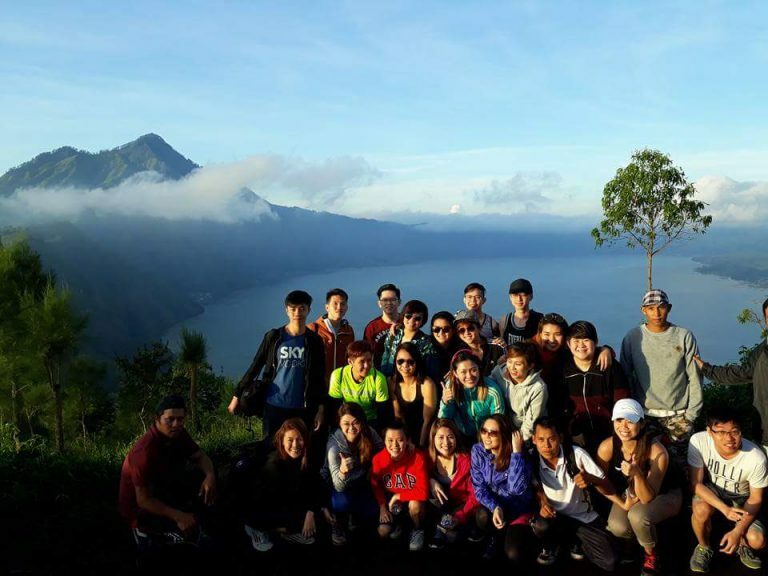 If you like peaceful trails through scenic forest and the colors of the sunrise reflecting off the glassy water of lake Batur, then this package is definitely for you. You’ll trek through the stunning jungle and along the rim of the volcanic crater with it’s amazing views. As you wind down the edge of the crater, you’ll make it to Pulak village where you’ll take a traditional boat back across Batur lake. The hike is not difficult, but you’ll definitely get your exercise for the day. After trekking, enjoy one more stop at the coffee plantation to see how local Luwak coffee is grown and made. Finish it off with some tea and coffee tasting before we head back to your hotel. As with all of our treks, you’ll begin early when our friendly driver picks you up from your hotel and takes you to your starting point at Pura Ulun Danu Batur, Songan Village, Kintamani. This is where you’ll meet your English-speaking guide who is a local of Kintamani. Here, he’ll brief you on the trek and answer any questions. 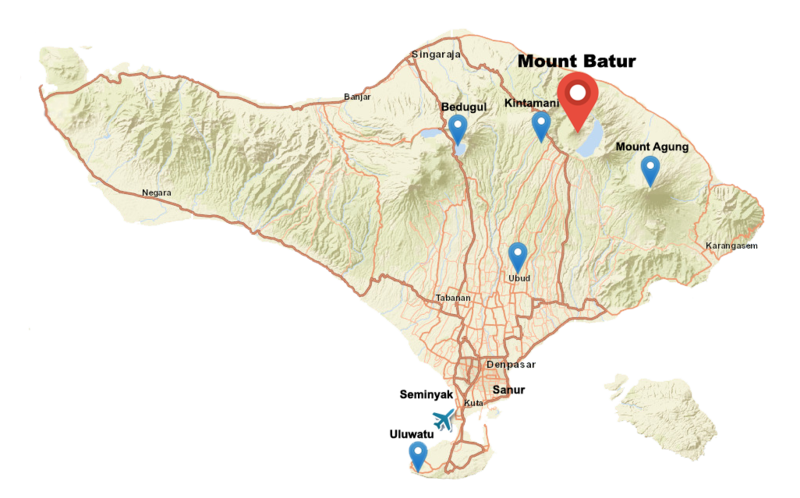 Caldera Batur has been a part of the Global Geopark Network (GGN) since 2012. 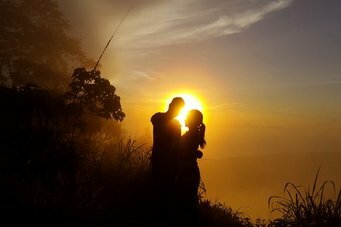 You’ll hike through the forest and along the Caldera crater until you reach the point at which to view the sun rise over the eastern sky. 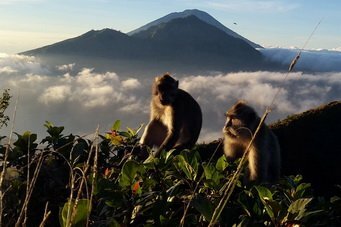 We’ll have breakfast and continue on, taking in the view of Batur lake, Mount Batur, Mount Agung and even across the sea to Mount Rinjani on Lombok Island. The views and scenery are indeed spectacular and make for excellent photo opportunities. You’ll also witness local farmers at work and will come across the famous village of Trunyan, whose villagers are happy to share their culture and customs with you. As you descend into the valley, you’ll hike along more scenic forest trails until you come to Pulak village where you’ll board the traditional canoe across the river to Toya Bungkah Village. After everyone has boarded the van, you’ll make one more stop at a coffee plantation to see how local Balinese coffee is grown and made. Here, you’ll get to taste the famous Luwak coffee, the rarest coffee in the world before you board the van one last time and head back to your hotel. 02.30 – 03.30 AM: Pick up time (depends on your hotel location). 05.00 AM: Starting point at Pura Ulun Danu Batur, Songan Village. 06.00 AM: Breakfast served by guide. 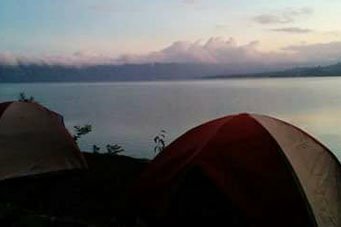 06.30 AM: Continue our trek around caldera crater and starting our descent to Pulak village. 08.30 AM: Leaving Pulak by traditional boat across Batur Lake. 09.30 AM: Prepare to depart. 11.30 AM: Stop at Balinese coffee plantation. 12.30 – 01:00 PM: Arrive back at your hotel. This package includes all park entrance fees. 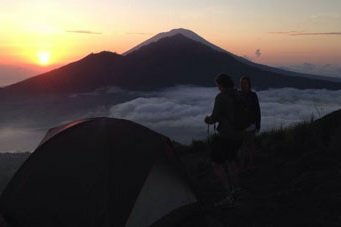 Bali Trekking Exploration has a very personalized service and the number of groups we take is limited. Therefore, to save costs, we must enforce our 2 person minimum policy. If you still wish to take one of our tours alone, we must add an additional 50% to the charge. Thank you for your understanding. If there are clouds, the sunrise may be difficult to see; however, that rarely disrupts the enjoyment of the trek as many guests have stated how pleased they were with the hiking and scenery, even when the sun is hidden by the clouds. Can I swim in Lake Batur? Yes. The lake is quite refreshing. You can also fish if you want. Legally, you can do this hike on your own if you pay the necessary fees, but we do not advise hiking in this area without a guide. it is easy to get lost and the trekking association can get protective of people entering the park without a licensed guide. If you do not choose us, please book your trek with a local, experienced, licensed guide who knows the area. Are children allowed on this hike? Yes. It is not a difficult hike and is suitable for children, but please watch them at all times so they may stay on the trial and under proper adult supervision. Though this is a low-difficulty hike, sometimes accidents do happen. Our guides are trained in basic first aid as well as local rescue procedures. If an accident occurs, they will first assess the situation and determine the best course of action. If evacuation is necessary, they will notify the Batur Rescue Team and arrange for the injured person to be taken to a hospital. Next of kin will then be notified. 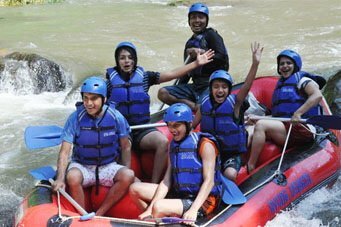 Bali Trekking Exploration does everything possible to ensure the safety and enjoyment of its guests. Caldera is a popular trek so there may be other trekkers during your hike. Our guides are experts in the local trails and know how to stay away from the crowds whenever possible.